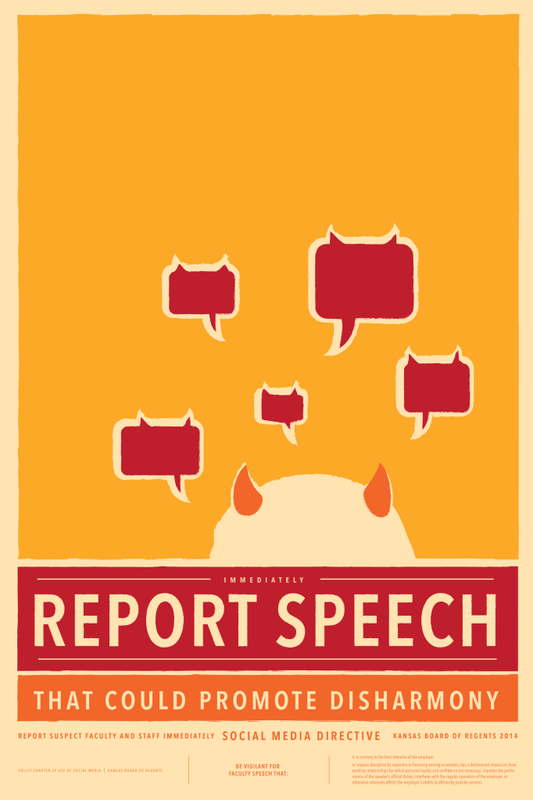 Under the Kansas Board of Regents‘ brave new social media policy, the faculty and staff of Kansas universities must make sure that their speech is harmonious, loyal, and conducive to discipline. So, the Kansas Board of Regents’ Committee for Harmony, Loyalty and Discipline is here to help you monitor speech. Our staff artist, Comrade Warner, has created these four handy visual aids — all designed to be printed as 24″ x 36″ posters. These come to you under Creative Commons: so, please print, make posters, put on t-shirts, remix, distribute. 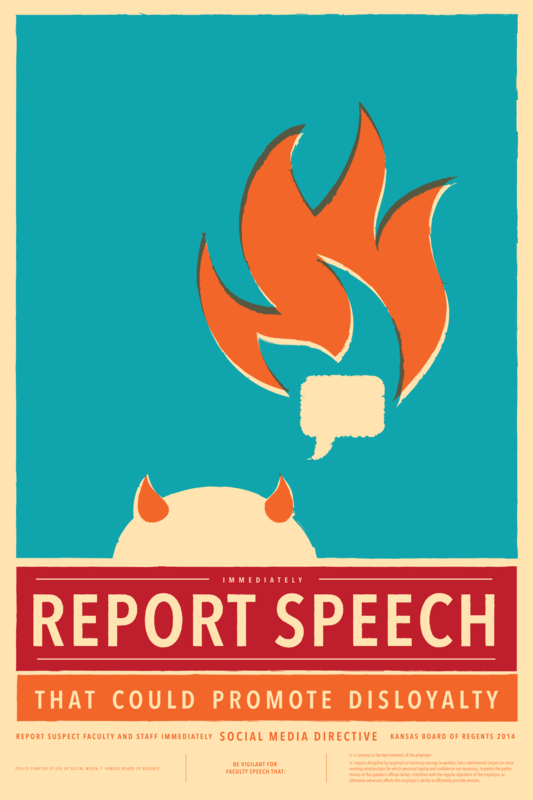 Remember: Report speech that may promote disloyalty. Report suspect faculty immediately. Surveillance is freedom! and the Kansas Board of Regents’ social media policy. To support the basic right to freedom of speech and to stand up for academic freedom, faculty, staff, and students from Kansas universities attended today’s Kansas Board of Regents meeting in Topeka, Kansas. The room was packed: standing room only. The Board of Regents were cheerful, chummy, and completely indifferent to the rights of those whom they allegedly represent. They rescinded our rights to freedom of speech, but they did it with a smile. Fred Logan told us that the Regents respect us, and passed a policy that does not respect academic freedom. Fred Logan [smiling]: Philip Nel? Fred Logan. I stand up. We shake hands. Logan: It’s nice to meet you. Me: It’s interesting to meet you. Logan: I’ve read what you’ve written about me, and I’ve looked at your website. Don DeLillo? Logan: I read Falling Man, and I was thinking about reading White Noise next. Good choice? And then, the meeting got underway. That was just one of many examples where Mr. Logan said one thing, but the actions of the Regents conveyed a rather different message. The revised policy retains all punitive parts. You can still be fired for a broad array of vaguely defined speech, such as uttering something “contrary to the best interests of the employer.” Presumably, a blog post (like this one) that is critical of the Kansas Board of Regents might be included in this restriction. 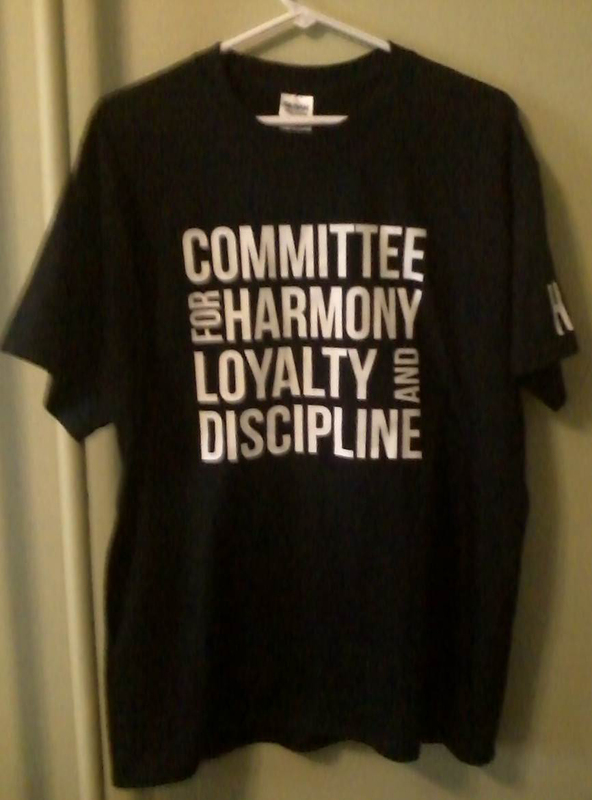 You can also be fired for speech that “impairs discipline by superiors or harmony among co-workers, has a detrimental impact on close working relationships for which personal loyalty and confidence are necessary.” This particular language, of course, inspired our “Committee for Harmony, Loyalty, and Discipline” t-shirts. How would one go about measuring the harmonious content of speech? How might we determine whether speech is disloyal? And as for impairing discipline, if I were to write that the Kansas Board of Regents have brought shame to the state of Kansas, and that all of them should resign effective immediately, is that a fireable offense? we fear that the most important point continues to be ignored. That point is this: a university system cannot properly function when external groups are allowed to influence university personnel decisions whenever they find certain speech to be objectionable. Because the punitive aspects of this policy create precisely this “heckler’s veto” scenario for controversial speech, we must once again respectfully request that the Board reconsider its determination that the disciplinary aspects of this policy are necessary and desirable. there are certain rights and responsibilities that are non-negotiable. However expedient it may seem at the time to surrender these cornerstones of the academic mission, there are certain principles that cannot be bargained away, because once they are conceded, the integrity of the entire enterprise is compromised. The freedom to speak without fear of reprisal is perhaps the ultimate example of a principle with which we are not at liberty to experiment and this is why we continue to oppose the punitive aspects of this policy. I found these sort of responses fascinating. Throughout this process, the Board’s attitude towards faculty has been condescending, patronizing, even hostile. The policy itself establishes new ways to fire people, based on very broadly defined objectionable speech. However, Regent Logan says, “We have the utmost respect for faculty.” The vast gap between word and deed is truly breathtaking. This is why I think that Mr. Logan may have a bright future in Kansas politics. Directly after Professor Lidzy’s statement, Logan got up, and rushed over to give her an award for her service, which — he said — the Board very much appreciated. Again, he is thanking her, even while he completely disregards what she has said. At the meeting we also learned that the Moody’s downgrade of Kansas’s credit rating (thanks to Governor Brownback and the legislature’s fiscal recklessness) will result in higher borrowing rates for Kansas universities. As my colleague Don Hedrick pointed out after the meeting, the Kansas Board of Regents’ actions also downgrades the rating of Kansas universities. The Regents passed their punitive social media policy. Of the policy, Fred Logan said, “This will be the strongest and most explicit statement on academic freedom that appears anywhere in our policy manual.” While it is true that the Regents did adopt the workgroup’s recommendations on language affirming academic freedom, it is also true that the Regents retained the original language eviscerating academic freedom. So, if this is their “strongest and most explicit statement on academic freedom,” that’s hardly a cause for rejoicing. 1. The actual line from Orwell’s 1984 is “If you want a picture of the future, imagine a boot stamping on a human face—forever.” But the Kansas Board of Regents tends to wear sensible shoes, and not boots. The bottom of my original post has links to many months of coverage. Peggy Lowe, “Strict Social Media Policy Approved by Kansas Board of Regents,” Kansas Public Media, KCUR 89.3 FM, 14 May 2014. This is an earlier version of the story that ran nationally. Scott Rothschild, “Regents approve social media policy; faculty, staff attend meeting to urge rejection,” Lawrence Journal-World, 14 May 2014. Celia Llopis-Jespen, “Faculty critical of Regents’ revised social media policy,” Topeka Capitol-Journal, 14 May 2014. Rhonda Holman, “Regents should revise social media policy,” Wichita Eagle, 14 May 2014. “Kansas Regents adopt revised social media policy; Some university professors believe it takes away their rights,” Kansas First News, 27 KSNT, 14 May 2014. Alan Greenblatt, “Kansas University Board Revises Its Free Speech Guidelines,” National Public Radio, reprinted on 90.9 WBUR, 14 May 2014. Associated Press, “Kansas Regents Adopt Revised Social Media Policy,” KSAL.com, 14 May 2014. Bryan Lowry, “Kansas Board of Regents Adopt Revised Social Media Policy,” Kansas City Star, 15 May 2014. “Kansas Regents Lose Respect with Bungled Social Media Policy,” Kansas City Star, 15 May 2014. Susan Kruth, “Kansas Board of Regents Approve Self-Contradictory, Unclear Social Media Policy,” The FIRE: Foundation for Individual Rights in Education, 15 May 2014. 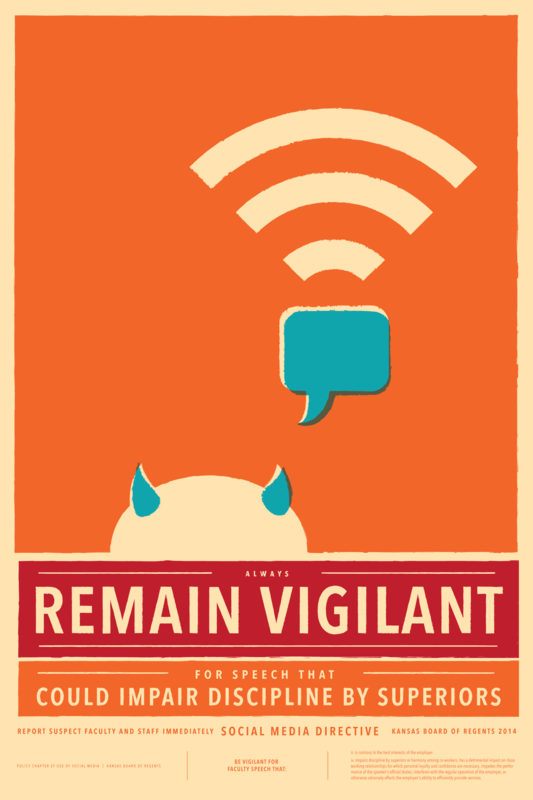 The Kansas Board of Regents’ new social media policy will require vigilant enforcement. How will we determine when speech is “contrary to the best interests of the employer”? How will we recognize speech that “impairs discipline by superiors or harmony among co-workers”? How can we prevent speech that has a “detrimental impact on close working relationships”? Given that academics work at all hours of the day and night, what constitutes “during the employee’s working hours”? 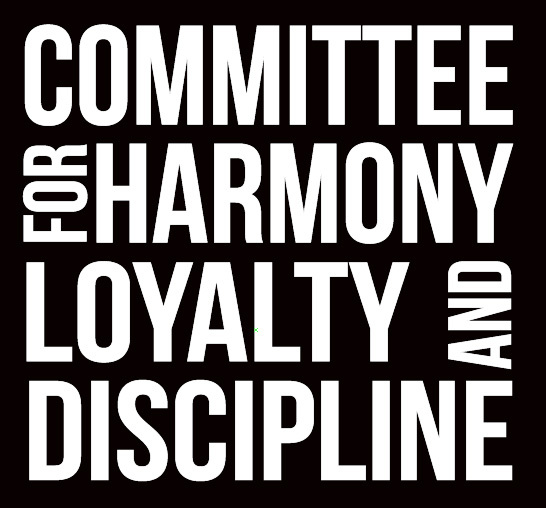 We are pleased to announce the formation of the Committee for Harmony, Loyalty, and Discipline. 3.iv. … impairs discipline by superiors or harmony among co-workers, has a detrimental impact on close working relationships for which personal loyalty and confidence are necessary, impedes the performance of the speaker’s official duties, interferes with the regular operation of the university, or otherwise adversely affects the university’s ability to efficiently provide services. Adopt our uniform! If you’d like to get one of these shirts, you could go down to Thread in Aggieville (here in Manhttan, KS): they have the design on file. 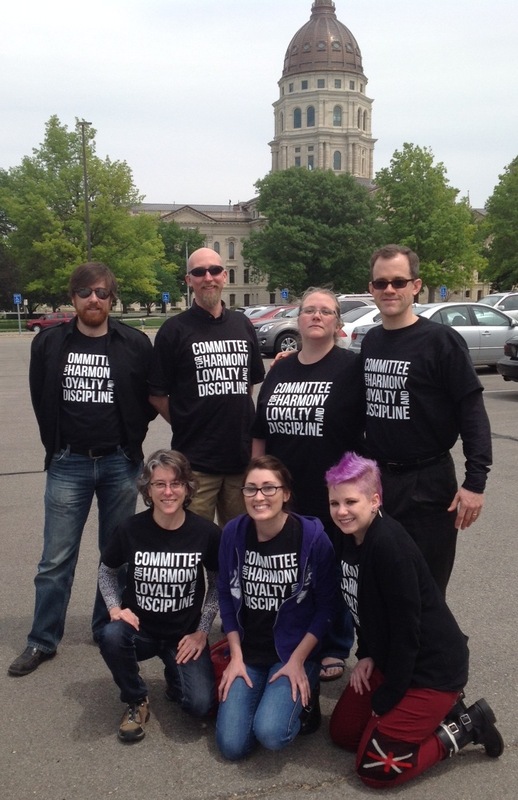 Just walk in and ask for this: “committee for harmony” design, in the May 8 folder. They’ll be able to access it and print you off one more or less immediately. If you are not in Manhattan, KS, Comrade Todd Gabbard would be happy to send you the file for the shirt so you can have it printed wherever you are. Alternatively, we might be able to make arrangements to get a shirt printed for you here and bring it to Wednesday’s Kansas Board of Regents meeting. Come to the Kansas Board of Regents meeting, Wednesday May 14th at 1:30 pm, Board Office, Suite 520, Curtis State Office Building, 100 SW Jackson, Topeka, KS. If you have one of these t-shirts, wear it to the meeting. We’d like to get as many faculty, students, and staff out to Topeka as we can. The Board of Regents’s new policy will govern the network of public institutions here in Kansas, and will affect us all for years to come. Should you have any questions or suggestions, please contact Comrade Todd Gabbard. Remember: Ignorance is strength! Freedom is slavery! When the Kansas Board of Regents announced its new social media policy on December 18, I thought it must have made a mistake. 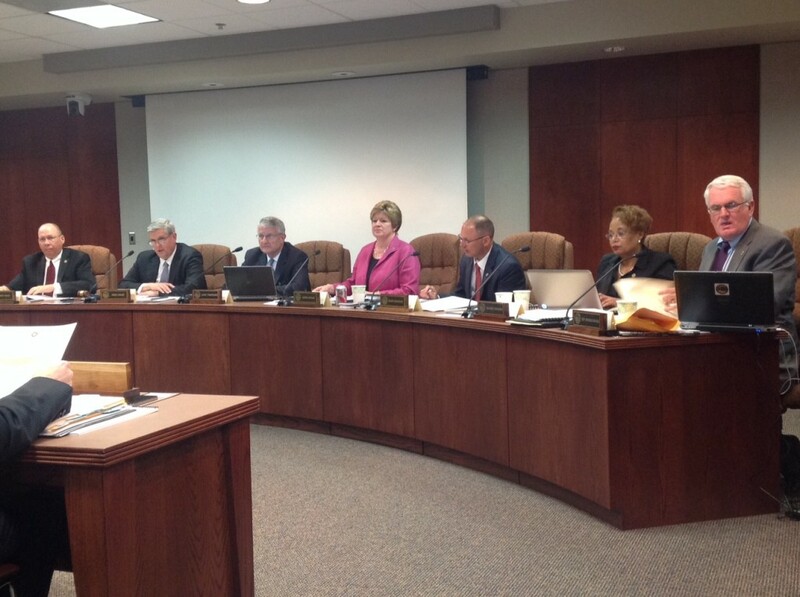 After all, this Board of Regents had seemed an ally of higher education in Kansas. Unlike previous Boards, this one had — for instance — been asking the Kansas Legislature to fund the state universities in Kansas. Adopting a social media policy that suspended freedom of speech and (in effect) eradicated tenure was surely because the hastily passed proposal was ill-considered. So, I thought: if we let the Board of Regents know how damaging the policy is, then they’ll realize that they’ve made a mistake, withdraw the policy, and start over. As emails and subsequent statements to the media have revealed, the Board of Regents crafted the most repressive policy that (it thought) would withstand a legal challenge. Working with State Attorney General Derek Schmidt, the Board created the policy using specific language from United States Supreme Court cases. Then, at its December meeting and over the objections of university faculty and administration present, the Board unanimously passed the new policy. The policy is not a mistake, but a carefully executed plan to muzzle free speech. This is why the Board passed the policy as faculty and staff were grading exams and preparing to leave town (indeed, many had already left town). This is why, though the policy has been panned with near unanimity from both within and beyond Kansas, the Board is not backing down. Another word for this sort of speech is doublespeak. Yet another word is lie. The creation of this policy was done with no input from university faculty or administrators; it was put near the end of an 84-page agenda without notification or announcement. The Council of Faculty Senate Presidents made a statement at the KBOR meeting on Wednesday, December 18, voicing our concerns about both the content and the timing of the policy change. We asked that the vote be delayed to a future KBOR meeting to allow for faculty input. The KBOR chose to proceed with a unanimous vote to pass the policy language. And yet Mr. Logan says that the Board approved the policy “in good faith.” Either his definition of “good faith” is so rare as to have eluded the dictionary-makers, or he is again lying. Based on the available evidence, he appears to be delivering another lie. It’s a very polite lie, but it’s a lie nonetheless. By failing to act in good faith and dressing its policy in doublespeak, the Kansas Board of Regents no longer deserves the confidence of those it serves. Since the Board itself is not an elected body, I doubt that a vote of no confidence would be persuasive. If the Board is so convinced that its draconian policy is correct that it’s willing to lie about it, then why would it care about a vote of no confidence? Further info. on the Board of Regents’ new social media policy. “Social media” means any facility for online publication and commentary, including but not limited to blogs, wikis, and social networking sites such as Facebook, LinkedIn, Twitter, Flickr, and YouTube. I understand why the Kansas Board of Regents would want to encourage responsible use of social media. However, I find it harder to understand how a body that oversees an educational system designed to foster free and open exchanges of ideas would seek to impede free and open exchanges of ideas. I also wonder how it expects to enforce a policy that violates the first Amendment to the U.S. Constitution, which prohibits laws “abridging the freedom of speech, or of the press.” I suppose the fact that a state has far deeper pockets than any individual does will be the Board of Regents’ strongest means of enforcement. At any rate, if you also find this decision troubling, you might let the Board of Regents know. The telephone number is 785-296-3421. Here is the contact information for Fred Logan (Chair of the Board of Regents), and contact information for all ten members of the Board of Regents. 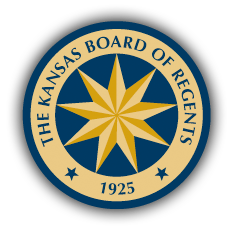 Contact information for all ten members of the Kansas Board of Regents. Suspensions, Terminations, and Dismissals (b) Other. The Board of Regents’ new social media policy. Workgroup’s “Discussion Draft” (pdf), 28 Feb. 2014. Comment form (scroll down). Scott Rothschild, “Regents pass social media policy in wake of Guth tweet,” Lawrence Journal-World, 18 Dec. 2013. “Kansas Board of Regents Agenda — social media policy,” Lawrence Journal-World, 18 Dec. 2013. Scott Jaschik, “Fireable Tweets,” Inside Higher Ed, 19 Dec. 2013. Charles Huckabee, “Kansas Board Says Universities Can Fire Employees for ‘Improper’ Tweets,” Chronicle of Higher Education, 19 Dec. 2013. Erik Voeten, “Kansas Board of Regents restricts free speech for academics,” Washington Post, 19 Dec. 2013. Ed Kazarian, “If I worked at Kansas University, this post might get me fired,” New APPS: Art, Politics, Philosophy, Science, 18 Dec. 2013. Scott Rothschild & Ben Unglesbee, “New social media policy is broad, vague, and ‘chilling'” Lawrence Journal-World, 19 Dec. 2013. Stephen Koranda, “Kansas Board of Regents Passes Social Media Policy.” KCUR 89.3 FM. 19 Dec. 2013. “‘In drafting the policy we’ve been very careful to protect the First Amendment rights of university employees, but also we’ve addressed the employee’s responsibility to universities,’ said Logan.” No, seriously: Fred Logan actually alleges that the social media policy protects First Amendment rights. Brian Leiter, “Kansas Board of Regents does something foolish and unconstitutional,” Leiter Reports: A Philosophy Blog, 19 Dec. 2013. Nick DeSantis, “AAUP Decries Social Media Policy in Kansas and Treatment of Colo. Scholar,” Chronicle of Higher Education, 20 Dec. 2013. Susan Kruth, “FIRE, AAUP Express Alarm Over New Kansas Social Media Policy,” Foundation for Individual Rights in Education, 20 Dec. 2013. 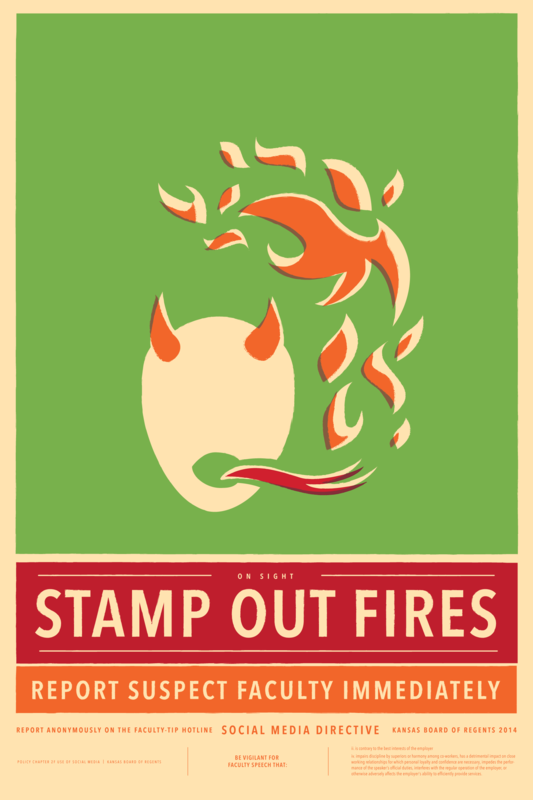 FIRE, the ACLU of Kansas, and the National Coalition Against Censorship have also sent a joint letter to the Kansas Board of Regents (pdf), 20 Dec. 2013. “Higher Education Is Not a Reality TV Show; or, How ‘Duck Dynasty’ Differs from the Kansas Board of Regents,” Nine Kinds of Pie, 20 Dec. 2013. Julia Keen, “Kansas State University Faculty Senate Responds to Kansas Board of Regents’ Social Media Policy,” 21 Dec. 2013. Ben Unglesbee, “State and national groups call for repeal of regents’ social media policy,” Lawrence Journal-World, 23 Dec. 2013. Brad Cooper, “Critics challenge Kansas Board of Regents’ new social media policy,” Kansas City Star, 26 Dec. 2013. Barbara Shelly, “Social media policy from Kansas Board of Regents threatens free speech,” Kansas City Star, 26 Dec. 2013. Max McCoy, “Free Speech? Not in Kansas Anymore,” Emporia Gazette, 28 Dec. 2013. Andra Bryan Stefanoni, “Social media policy for Kansas universities panned,” Joplin Globe, 28 Dec. 2013. Tim Schrag, “Regents took comment consequences too far,” Hutchinson News, 28 Dec. 2013. Scott Rothschild, “Regents call for review of recently approved social media policy,” Lawrence Journal-World, 31 Dec. 2013. Frank D. LoMonte, “A Dangerous Policy,” Inside Higher Ed, 2 Jan. 2014. “Kansas Board of Regents Reviews Controversial Social Media Policy,” Inside Higher Ed, 2 Jan. 2014. 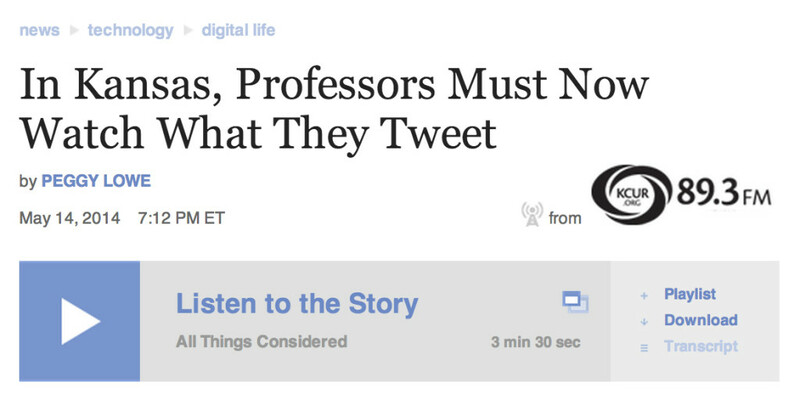 Philip Nel, “KSU Professor weighs in on social media policy,” Lawrence Journal-World, 7 Jan. 2014. “Distinguished Professors from KU and KSU: Open Letter to the Kansas Board of Regents.” This ad ran in the Manhattan Mercury, the Lawrence Journal-World, and the Topeka Capital Journal on 12 Jan. 2014. Philip Nel, “Kansas Board of Regents, Freedom of Speech, and Bad Faith,” Nine Kinds of Pie, 17 Jan. 2014. Ben Unglesbee, “Sorting out the legal issues of the regents’ social media policy,” Heard on the Hill (JL World.com weblogs), 22 Jan. 2014. Steve Kraske and Beth Lipoff, “Social Media Policy Making Waves at Kansas Universities,” KCOR, 22 Jan. 2014. Scott Rothschild, “Working group studying regents’ social media policy will write its own version,” Lawrence Journal-World, 24 Jan. 2014. Max McCoy, “KBOR: Suspension is not an Option,” Signals and Noise, 26 Jan. 2014. April Mason, “From the Provost’s Desk: Social Media,” K-State Today, 28 Jan. 2014. Ben Unglesbee, “KU governance leaders call for suspension of social media policy,” Lawrence Journal-World, 28 Jan. 2014. “University governance groups fighting Kansas regents’ social media policy,” Wichita Business Journal, 29 Jan. 2014. Philip Nel, “What Can’t You Say in Kansas? An Experiment in Civil Disobedience,” Nine Kinds of Pie, 29 Jan. 2014. Ben Unglesbee, “Taking to social media to test the social media policy,” Lawrence Journal-World, 31 Jan. 2014. John M. Crisp, “A university isn’t a business, even in Kansas,” The Gulf Today [United Arab Emirates], 4 Feb. 2014. K-State Collegian, “Senate passes social media, smoking resolutions,” K-State Collegian, 7 Feb. 2014. Scott Rothschild, “Regents push back at criticisms of social media policy,” Lawrence Journal-World, 12 Feb. 2014. Ben Unglesbee, “KU students call on regents to suspend social media policy,” Lawrence Journal-World, 13 Feb. 2014. Max McCoy, “Between a Rock and the Regents,” Signals and Noise, 14 Feb. 2014. McKenna Harford, “New Social Media Policy Under Review,” University Daily Kansan, 5 Mar. 2014. “Kansas Faculty Release Social Media Policy Draft,” Inside Higher Education, 6 Mar. 2014. Ben Unglesbee, “The David Guth of Wisconsin,” Lawrence Journal-World, 12 Mar. 2014. 2014 Jefferson Muzzles, 9 Apr. 2014. The Kansas Board of Regents wins a Muzzle Award for its social media policy. Carl Straumsheim, “The Right to Tweet,” Inside Higher Ed, 10 Apr. 2014. Kansas Universities Faculty and Staff Against Regents Speech Policy. Facebook group opposed to new policy. @UnivKansasProf. “Best. Job. Ever.” Satirical Twitter account inspired by the new policy. Steven Greenhouse, “Even If It Enrages Your Boss, Social Net Speech Is Protected,” New York Times, 21 Jan. 2013. American Association of University Professors and Association of American Colleges, 1940 Statement of Principles on Academic Freedom and Tenure. Bill of Rights, Library of Congress. George Orwell, 1984. It’s public domain in Australia. Or you might check a copy out of your local library. 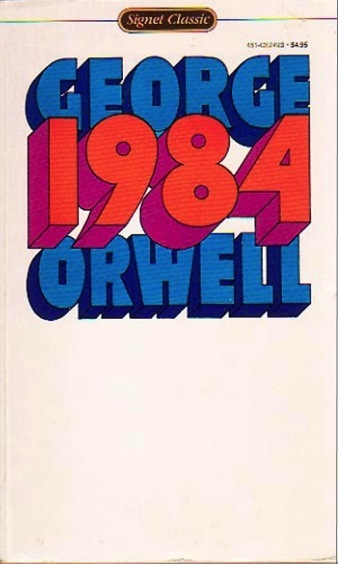 On line, you can read Orwell’s letter on why he wrote 1984. Thomas Frank, “The matter with Kansas now: The Tea Party, the 1 per cent and delusional Demorats,” Slate 16 Feb. 2014. Peter Schmidt, “One Email, Much Outrage,” Chronicle of Higher Education, 10 Mar. 2014.